PHILADELPHIA, Dec. 28 -- Asthma mortality rates are declining worldwide, largely due to increased use of inhaled corticosteroids to manage the disease. That was the conclusion of an international group of researchers, who presented data on world trends. The following summary reviews some of the highlights of the year in asthma research. For fuller accounts, links to the individual articles published in MedPage Today have been provided. Continue reading The Year in Asthma. Continue reading Cleveland Clinic gives Asthmatx Top 10 award. Is that runny nose a cold, an allergy, or sinusitus? The cold-allergies question is complex, says a pediatrician and father in Concord. "This is something we struggle with as pediatricians every day," says Dr. Greg Guerriero. Teachers reluctantly deal with the issue as well, wondering whether their snotty-nosed charges should be at home. Continue reading Is that runny nose a cold, an allergy, or sinusitus?. NEW YORK (Reuters Health) - Under-the-tongue or "sublingual" immunotherapy -- what doctors call SLIT -- is cost-effective for treating adults with pollen-induced respiratory allergy, according to a report. SLIT is not officially in use in the United States, although some allergists use it "with satisfactory results," Dr. Giovanni Passalacqua from University of Genoa, Italy told Reuters Health. "The problem is formal, due to the fact that SLIT has not the approval of the FDA. Clinical studies endorsed by the FDA are currently ongoing to get the approval." "In Europe the situation is completely different, and SLIT is widely used in many countries (e.g., Italy, Germany, France, Spain, Portugal, Greece, and Hungary)," Passalacqua said. Continue reading Under-the-tongue allergy therapy cost-effective. Continue reading Toyota may agree to provide health-care aid to asthmatics. Asthma UK and the Royal Society of Medicine are offering people with asthma a unique opportunity to influence the future of asthma research. Medicine and Me: Asthma Research will bring people with asthma, their families and carers, together with researchers and health professionals to exchange their views on the key challenges in basic asthma research. The event aims to make science more accessible to people with asthma and ensure the strategy reflects their needs. It takes place on 19 February at the Royal Society of Medicine, London. Supported by AstraZeneca, it will include a mix of presentations and discussions, followed by an evening reception. Continue reading The Future Of Asthma Research. Continue reading EU Prioritises Allergic Diseases In The Seventh Framework Programme For Research (repost). Continue reading Allergy or Asthma Problems? Try a High Quality Air Filter. The pool chlorine hypothesis postulates that the rise in childhood asthma in the developed world could result at least partly from the increasing exposure of children to toxic gases and aerosols contaminating the air of indoor chlorinated pools. To further assess this hypothesis, we explored the relationships between childhood asthma, atopy, and cumulated pool attendance (CPA). We studied 341 schoolchildren 10-13 years of age who attended at a variable rate the same public pool in Brussels (trichloramine in air, 0.3-0.5 mg/m3). Examination of the children included a questionnaire, an exercise-induced bronchoconstriction (EIB) test, and the measurement of exhaled nitric oxide (eNO) and total and aeroallergen-specific serum IgE. CPA by children (range, 0-1,818 hr) emerged among the most consistent predictors of asthma (doctor diagnosed or screened with the EIB test) and of elevated eNO, ranking immediately after atopy and family history of asthma or hay fever. Although the risk of elevated eNO increased with CPA [odds ratio (OR) = 1.30 ; 95% confidence interval (CI), 1.10-1.43] independently of total or specific serum IgE, the probability of developing asthma increased with CPA only in children with serum IgE > 100 kIU/L (OR for each 100-hr increase in CPA = 1.79; 95% CI, 1.07-2.72). All these effects were dose related and most strongly linked to pool attendance before 6-7 years of age. Use of indoor chlorinated pools especially by young children interacts with atopic status to promote the development of childhood asthma. These findings further support the hypothesis implicating pool chlorine in the rise of childhood asthma in industrialized countries. Continue reading Chlorinated Pool Attendance, Atopy, and the Risk of Asthma during Childhood. Continue reading Percentage of asthmatic kids doubles in 10 years. LONDON (AFX) - Vectura Group PLC has struck a US collaboration and development deal with a 'leading international pharmaceutical company' for its generic combination asthma therapy, VR315. In a statement, the British drug developer said it will share the profits from any eventual sales of the product, and could receive up to 63 mln usd in milestone payments. The therapy is thought to be a copycat version of GlaxoSmithKline PLC's top-selling asthma drug Advair, which generated sales of 3 bln stg last year and will lose patent protection in around 2010. Continue reading Vectura signs US development deal for asthma therapy. ST. LOUIS — People with wheat allergies who have stayed away from beer now have a new option. Anheuser-Busch Cos. Inc. today introduced Redbridge, which the company called the first nationally available sorghum beer. Starting today, Redbridge is available in restaurants and stores carrying organic products. Sorghum is the primary ingredient in the beer from the makers of the nation's top-selling full-calorie and light beers, Budweiser and Bud Light. Sorghum is a safe grain for those with wheat allergies. Anheuser-Busch is also marketing the beer as an alternative for those who choose wheat-free or gluten-free diets. Continue reading Brewery unveils beer for those with wheat allergies. Continue reading Half of Newly Diagnosed Asthma Patients Do Not Fill a Prescription for Treatment. BOSTON - Traveling to school should become a healthier experience for Massachusetts children after state officials make good on their pledge to reduce school bus exhaust emissions by 90 percent over the next three years. Department of Environmental Protection spokesman Ed Coletta said Monday that the state would spend $22.5 million over the next three years to install exhaust filters on all school buses and regional transit authority buses throughout Massachusetts. Roughly 8,000 school buses and about 600 regional transit buses will be retrofitted. “It’s clearly going to be very beneficial,” Coletta said about reducing the amount of particulate-filled soot spewed by the buses’ diesel engines. “Children tend to breathe more deeply than adults. They’re clearly at a very tender age where the emissions could impact them. This is an important piece to make sure they’re protected,” he said. Continue reading State to reduce emission on school buses by 90 percent. BALTIMORE - New findings show Maryland’s children are among the most likely in the country to have asthma, and the state’s high levels of air pollution only make their problems worse. The report by the Centers for Disease Control and Prevention states that Maryland is tied with Oklahoma for the third-highest level of childhood asthma in the nation, among the 37 states that had information available. About 11 percent of the state’s children had asthma in 2005, says “The State of Childhood Asthma” report. Children with asthma miss school, are sent to the hospital and can die from struggling to breathe, states the report, which was released last week. Continue reading Environmental group says study links smog and child asthma. Continue reading MedImmune gets license to develop asthma drug. Christmas greenery, holiday flowers and yuletide fires can inflame allergies, causing itchy eyes, runny noses and skin rashes, experts warn. No wonder Rudolph's nose was red. Most holiday allergies are minor, but for anyone with asthma and other lung conditions, they can cause serious breathing problems, says allergist James Seltzer, chair of the Indoor Allergy Committee of the American College of Allergy, Asthma and Immunology. Continue reading If you have allergies, check this holiday list twice. Continue reading Novartis, SkyePharma receive FDA approval for asthma spray Foradil. Continue reading Asthma Prevalence High in Children Who Snore. GENEVA, Switzerland, Dec. 15 -- A common cold virus can be deadly for lung-transplant recipients, reported researchers here. Two of 11 recipients infected with human rhinoviruses developed progressive respiratory and graft dysfunction leading to their deaths, reported Laurent Kaiser, M.D., of the University Hospital of Geneva, and colleagues. The findings flout conventional wisdom holding that human rhinoviruses only infect the upper respiratory tract, the investigators wrote in the second December issue of the American Journal of Respiratory and Critical Care Medicine. Continue reading Rhinoviruses Fatal to Lung Transplant Recipients. A recent report by the EU-backed Network of Excellence GA2LEN, Global Allergy and Asthma European Network, highlights new suspected linkages between diet and allergies, particularly in children. Experts suggest that there has been a fundamental shift in European diets over the past twenty to forty years exposing children and adults alike to greater risks of allergies. Such findings by the nutrition network are indicators of the fresh research the network can contribute to this complex field. According to experts, fully one third of children and approximately half of the European population will be allergic to one thing or another by 2015. It is widely accepted that an unfortunate combination of hereditary and environmental factors contribute to the development of allergies and asthma. However, a sharp increase in the number of cases has lead researchers to believe that something more than genetics is at play. Continue reading European experts point to diet, allergy link; call for wider research. Nearly one in 10 American children now has asthma, a sharp rise that still has scientists searching for a cause, a CDC report concluded Tuesday. An estimated 6.5 million children under age 18 (8.9%) are now diagnosed with the disease. The rate has more than doubled since 1980, according to the report. At the same time, racial disparities show evidence of worsening. While 8% of white children are estimated to have asthma, 19% of Puerto Rican children and 13% of black children have the disease. Continue reading Childhood Asthma Rise Remains a Puzzle. Continue reading State of Childhood Asthma, United States: 1980-2005. A new study by specialists at the Johns Hopkins Children's Center and elsewhere suggests that only one in five inner-city children with chronic asthma gets enough medicine to control dangerous flare-ups of the disease. The findings, reported in December's Pediatrics, are disturbing, the researchers say, because preventive therapy failure leads to overreliance on fast-acting "rescue" drugs after an asthma attack strikes and to more complications and increased risk of death. The scientists interviewed parents of 180 Baltimore City children 2 to 9 years of age diagnosed with persistent asthma and studied pharmacy records. Overall, only 20 percent of the 180 children got the recommended amount of daily controller medication, which is six or more refills in a 12-month period. Sixty percent got too little therapy to fully prevent flare-ups, and 20 percent either got no medication at all or relied solely on quick-relief rescue drugs, which stop an asthma attack from progressing. Continue reading City Kids with Asthma Lose Out On Preventive Treatment. Alliant will promote kids' Allegra in U.S.
U.S. firm Alliant said Monday it has signed a deal with Sanofi-aventis to co-promote allergy drug Allegra in the United States. Under the terms of the pact Alliant will promote Allegra Oral Suspension to pediatric and pediatric sub-specialty physicians. "Our core mission is to provide pediatricians with alternatives that meet the unique needs of their patients," said Alliant President Mark Pugh. Continue reading Alliant will promote kids' Allegra in U.S.. Many experts believe the current advice to parents to keep peanuts away from their babies may be making the problem worse. In Africa, Asia and China, where peanuts are a staple food and routinely given to young children, rates of peanut allergy are lower than they are in the West. Other research suggests the opposite - that early exposure to peanuts makes an individual more susceptible. Parents are being asked to volunteer their babies for a major investigation into the causes of peanut allergy. Continue reading Peanut allergies may be caused by anxious mothers. Continue reading Fish and whole grains linked to asthma protection. New Zealand - Government drug-buying agency Pharmac is under fire from asthma sufferers as it again considers sole funding of an unpopular alternative to Ventolin. Pharmac's decision last year to subsidise only one salbutamol inhaler, Salamol, failed as asthmatics overwhelmingly rejected the cheaper option. Hospital emergency department doctors reported an increase in admissions of children who had refused to use Salamol because of the taste. Continue reading Pharmac under fire over asthma. Fatty diets could be responsible for the increase in the number of people suffering from asthma, Australian scientists say. Researchers at the Sydney-based Garvan Institute have found a link between dietary fats and the immune system, News Limited newspapers report. They believe this could be the connection to a rise in inflammatory conditions such as asthma, which doubled between 1985 and 2001. Continue reading Fatty diets 'behind rise in asthma'. (KDKA) PITTSBURGH Doctors at Children's Hospital in Pittsburgh have developed a new way to find out if children are suffering from asthma. Often times when dealing with the youngest patients, doctors cannot label it asthma because patients are too young for a definitive diagnostic test called spirometry. You have to be six or older, and be able to breathe in deeply and blow out all the air. "That maneuver is very difficult and requires a lot of effort," said Dr. Jonathan Finder. "It's very hard to get children to understand the concept." Continue reading Local Doctors Develop New Asthma Test. Did you know that almost 12 million Americans have a food allergy? About one out of every 25 American children under the age of 18 has a food allergy. Scientists have discovered that in the past five years, the existence of peanut allergy in children has doubled. Did you know that there are approximately 150 to 200 food allergy-related deaths each year in the United States? With the increased prevalence of food allergies, you probably will prepare food for someone with a food allergy, dine with someone with a food allergy or be a friend of someone with a food allergy. Continue reading Know someone with a food allergy? Be a PAL. OTTAWA, ONTARIO--(CCNMatthews - Dec. 7, 2006) - The Canadian Food Inspection Agency (CFIA) is warning people with allergies to almond, peanut, or hazelnut proteins not to consume the Schär brand Wafers and Biscotti products described below. The affected products may contain almonds, peanuts, and hazelnuts, which are not declared on the label. All Best Before dates and lot codes of the following Schär brand products, imported from Italy, are affected by this alert. Continue reading Undeclared Almonds, Peanuts and Hazelnuts in Schar Brand Wafers and Biscotti Products. LACKLAND AIR FORCE BASE, Texas (AFPN) -- A 59th Medical Wing allergy team won the 15th Annual American College of Allergy, Asthma and Immunology Fellows-in-Training Bowl held Nov. 6 in Philadelphia. Allergy specialists Maj. (Dr.) Stephen Scranton and Capt. (Dr.) Chris Calabria, with the 759th Medical Operations Squadron at Wilford Hall Medical Center at Lackland AFB, Texas, beat out 21 teams from top allergy fellowship programs across the nation in the academic competition. "It was an honor to represent the Allergy Program and Wilford Hall in this competition," Captain Calabria said. "Our win is a testament to the great program that our current and prior WHMC staff members have created." Continue reading Air Force allergy doctors win FIT competition. Nearly half of the U.S. population lives in areas with unhealthy ozone levels, according to a 2006 report. For people with respiratory and lung diseases, especially the estimated 20 million Americans with asthma, "bad air" days pose an exceptionally high risk. The health risks associated with high levels of ozone aren't limited to summer months, and people can feel the effects of smog all year long. Over the last decade, ozone levels have increased for many reasons, including higher temperatures and humidity, said John D. Cox, author of "Weather for Dummies." Despite this, people are still unaware that ozone is dangerous even at its lowest levels. When inhaled, ozone can irritate lung airways and cause inflammation, and exposure to elevated levels of ozone can also increase the need for medical treatment and hospitalization in people with asthma. People who are active and people with asthma and other respiratory problems are at a higher risk on these days. Continue reading 'Bad air' increases health risks for millions of asthma patients. AUSTRALIA - Asthma is the most-common medical condition amongst Canberra school students and a leading cause of absenteeism affecting one in six students. There are about 62,400 people in the ACT under 15, and while not all of these are at school, one in six will be debilitated to varying degrees because of asthma. Recognising this problem, the Federal Government, with the involvement of the Asthma Foundations, launched the Asthma Friendly Schools program to support children with asthma, and to enable the school staff to better handle asthma emergencies if they arise. The Asthma Foundation ACT is rolling out the program in Canberra. Schools are invited to participate and when they meet the required criteria they are certified "asthma friendly". Continue reading Allergies on the increase. Continue reading Benefits and Risks for Inhaled Corticosteroids in Children: An Expert Interview With David B. Allen, MD. Continue reading Many urban children don't get asthma drugs. Continue reading Kids With Asthma: Obesity More Likely. 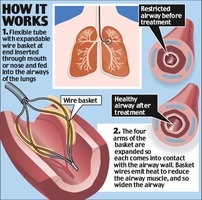 A tiny heater that warms the lungs and airways is being used to treat asthma. The device, which is inserted through the nose or mouth, gives ten-second blasts of mild heat to the muscles to stop them contracting. Research shows that the beneficial effects of three sessions of the device, now on trial at five hospitals in the UK, can last for more than two years. Asthma is a major and increasing health problem, with 5.2 million people in the UK currently receiving treatment, including 1.1 million children. Continue reading Tiny heater inside your lungs could end asthma inhalers. Continue reading Late start to European winter troubles skiers, bears and asthma sufferers. Continue reading EU prioritises allergic diseases in the Seventh Framework Programme for Research. Continue reading ICC Could Be Hazardous To Your Children's Health. OTTAWA, ONTARIO--(CCNMatthews - Nov. 30, 2006) - The public warning issued on November 24, 2006 has been updated to include additional allergen risk and product information. The Canadian Food Inspection Agency (CFIA) is warning people with allergies to almond protein or peanut protein not to consume the Schar brand Snack - gluten free chocolate wafers with hazelnuts. The affected product may contain almond and peanut proteins which are not declared on the label. All Best before dates and lot codes of this product described below are affected by this alert. The Schar brand Snack - gluten free chocolate wafers with hazelnuts, a product of Italy, is sold in a 105 g package bearing UPC 8 008698 005286 on the back panel. On some packages, the UPC on the back panel may be covered up with a sticker. These packages have a white sticker on the front panel which bears a different UPC 8 00869 80528 6. Both the UPC are affected. The package contains three individually wrapped 35 g Snack bars. Continue reading Allergy Alert - Undeclared Almond and Peanut in Schar Brand Snack-Gluten Free Chocolate Wafers with Hazelnuts. DALLAS - T-H Foods is recalling some crackers that may contain undeclared milk and could be harmful to people with certain food allergies. The Illinois-based company says its Crunchmaster Sesame Rice Crackers were distributed to Costco warehouses in Dallas and Sumner, Washington.The crackers were packed in a 6-count multipack that includes sesame and cheese flavors. The packages are labeled "Best Before date of Jun082007B. "Consumers with questions should contact TH Foods at: 1-800-896-2396. Gut parasites could hold the key to increasingly common conditions such as eczema, asthma and hay fever, according to scientists at The University of Nottingham. Gut parasites, such as hookworm, have evolved together with their human hosts for millions of years. Over time, these parasites have developed ways of surviving in the human gut by 'turning down' the immune response directed against them, prolonging their survival inside the host. This reduction in immune response may also have the effect of reducing allergic tissue reactions that characterise asthma and other allergic conditions. Continue reading Vietnam study probes the role of gut worms in allergies. This page is a archive of recent entries written by ID Admin in December 2006. ID Admin: November 2006 is the previous archive. ID Admin: January 2007 is the next archive.